United National Party (UNP) parliamentarian Eran Wickramaratne recently urged Sri Lankan professionals to play an active role in governance to nudge the country into the right direction, stressing that the business of the government is also the business of professionals. “They (politicians) are never going to ask you. If you want to change the destiny of this country, we have to have the ownership and we have to take responsibility. “The system works for those who are already in it, and therefore, why should they change it? There is no point complaining about it, because complaining will not really help to change the situation. The professionals are needed in politics. There’s no point lamenting the issues that we are facing,” he said. 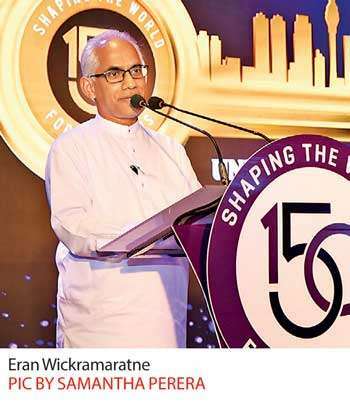 Wickramaratne was addressing construction industry professionals at the 150th anniversary celebration of the Royal Institution of Chartered Surveyors (RICS) organised by RICS Sri Lanka in Colombo, last week. He emphasised that there is a dire shortage of professionals in politics of the country, while pointing out that the majority of the lawmakers in the country don’t have a sense of what they are doing. “I have been often told that I’m the first institutional professional—CEO of a public quoted company in the 70-year history of Sri Lanka’s Parliament. You (professionals) talk about policy, process and you want to make sure that there is a professional touch in that. Your professional procedures have codes of conduct, you know what conflict of interest is, and you know how you and your profession are governed. However, don’t assume that these concepts are automatically accepted in the halls of governance in this country,” Wickramaratne said. Commenting on the current political crisis in the country, he said that while the public were adversely impacted by it, the MPs are benefitting from the crisis. “What’s the discussion in our country today? Who has benefited from the crisis that we are facing? It’s only the members of the Parliament who have benefited, because our monetary value has gone up. I am ashamed to say that and it’s no joke. This is the culture that we must change, because it’s an indictment on our country,” he said. Moving forward, Wickramaratne noted that the professionals can respond to the current deadlock situation in two ways—ignore the whole thing or support the right principles and policies. “One way to respond is to walk away and say we can’t do anything about it or we don’t care about it. Your children will migrate, that’s the result of that attitude. “But if you take the responsibility, we can change it however, dark it might look. Therefore, I urge the professionals, lets resolve this in our country and let’s change,” he said. Speaking of the construction sector, Wickramaratne acknowledged that local construction firms have been facing unfair competition from foreign firms, who are competing with local firms with cheap imported foreign labour. “The local industries have to compete with the labour coming from elsewhere, which doesn’t have the same cost. Then it become unfair competition. Therefore, we have to protect our industries, not from competition, but from unfair competition. Therefore our government will take necessary steps to do so,” he said.